Terry said he'd meet Rich and Dave at two o'clock. Rich and Dave arrived at the agreed upon meeting place together, 15 minutes ahead of schedule. Now, you should know that this was back in the day when cell phones and iPads hadn't been invented yet. And people would have looked funny carrying a rotary phone in their pocket. Plus the telephone cord would have to be super long. Anyway, Rich and Dave were forced into a little session of "I Spy With My Little Eye" to pass the time until Terry arrived. 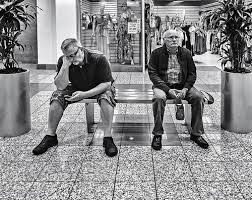 As it turned out Terry was unavoidably detained and Rich and Dave were simply dying of boredom. After all, when you've seen one chrome refrigerator in the appliance store you've seen them all. Neither of them had thought to bring a pencil or paper so tic-tac-toe and origami were both out. Tick-tock, tick-tock the time passed so slowly they were bored right out of their skulls. At last, 30 minutes past the time they were supposed to meet, Terry arrived on the scene. "Sorry, I'm late" chirped Terry, "but I got held up". "Held up, cried Rich. "Did they get anything of value?" "Not that kind of 'held up'" replied Terry. "It's a figure of speech. I guess the joke's on you." "Listen" remarked Rich, "after all the time we waited for you it certainly is ennui." The prompt from Tara at Two Word Tuesday is ennui/boredom this week. And I'm sorry but the joke's on you.